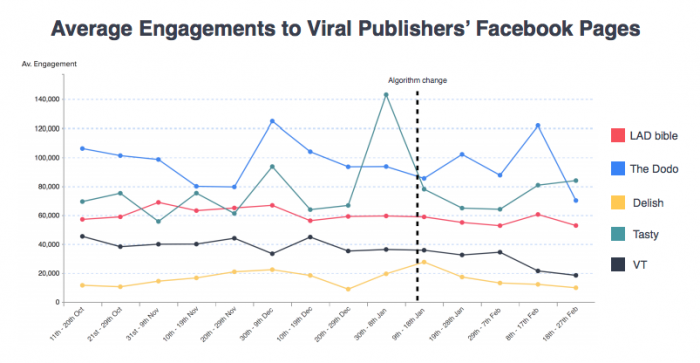 March 29, 2018, 12:11 p.m.
NewsWhip, the social media monitoring company, crunched some numbers on how publishers’ Facebook pages have been faring since then and offered some tips for not being the next Little Things, Cooking Panda, or Opposing Views. The full report can be found here. 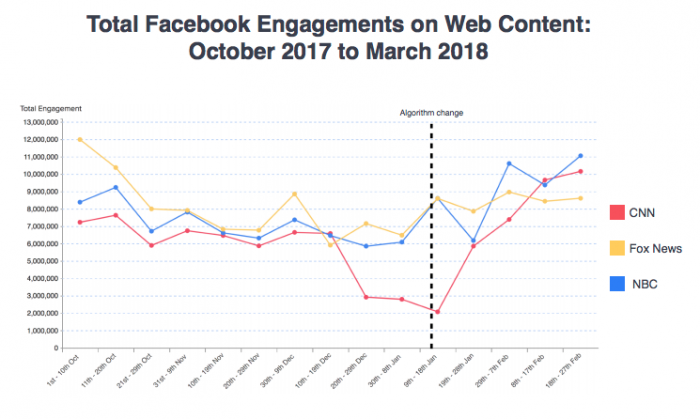 Over half of the stories with top engagement in the past two months include hard news/current events/breaking news: “Surprisingly, the top stories since the algorithm change have had a good deal of breaking news at the top of the chart. 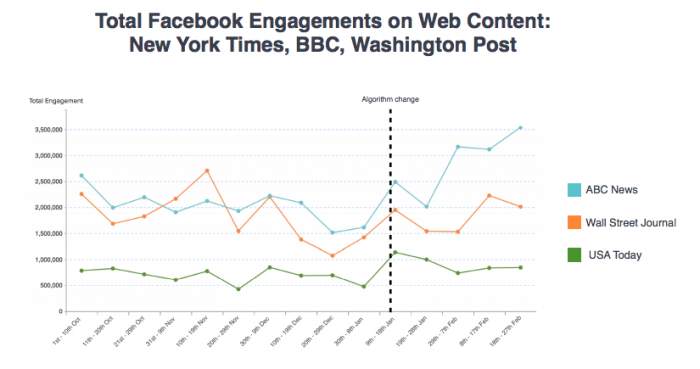 In fact, since the Facebook algorithm change, 56 of the top 100 most engaging articles as of March 15th have been hard news/current event stories.” NewsWhip also noted that 53 of the top 100 stories were from general news publishers. Misinformation isn’t gone: A fake story about how the “‘disastrous’ flu shot is causing a deadly flu outbreak” was the 26th most engaging story since the algorithm change, with almost 850,000 engagements on Facebook. 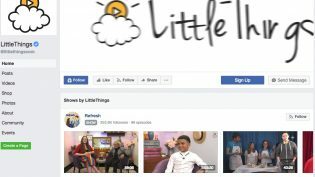 Niche, viral publishers are still figuring things out, though Little Things was the first one to go. Some organizations are using e-commerce as a buffer: NewsWhip says PopSugar will start hawking beauty products and High Snobiety has a goal to make e-commerce 30 percent of its revenue. NBC News has bested Fox News as the most engaged publisher on Facebook for the first time since January 2017, signaling that “the major sites with network abilities and scale in breaking news events are likely to continue to perform well on social media,” NewsWhip says. 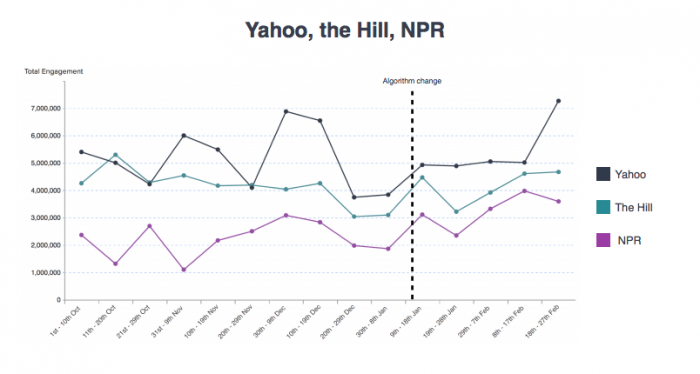 Reporters from hyperpartisan sources are still outpacing non-hyperpartisan reporters. Schmidt, Christine. 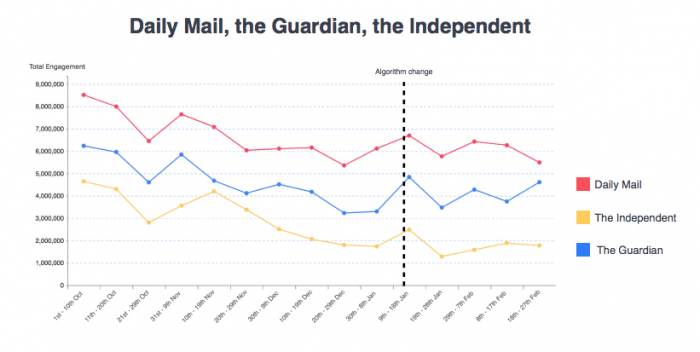 "Two months post-News Feed tweak: real news is not drowning, comments are growing, and videos are still winning, NewsWhip says." Nieman Journalism Lab. Nieman Foundation for Journalism at Harvard, 29 Mar. 2018. Web. 25 Apr. 2019. Schmidt, Christine. 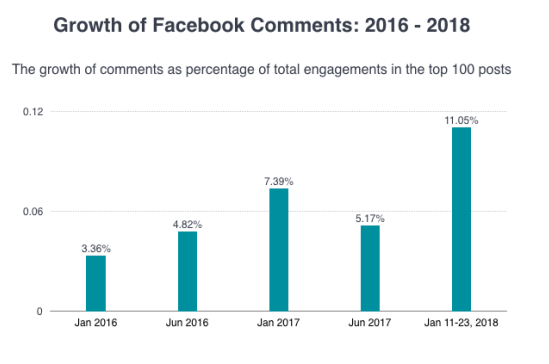 "Two months post-News Feed tweak: real news is not drowning, comments are growing, and videos are still winning, NewsWhip says." Nieman Journalism Lab. Last modified March 29, 2018. 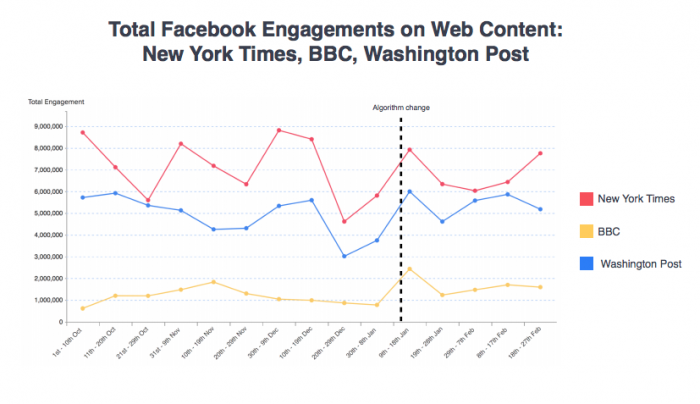 Accessed April 25, 2019. https://www.niemanlab.org/2018/03/two-months-post-news-feed-tweak-real-news-is-not-drowning-comments-are-growing-and-videos-are-still-winning-newswhip-says/.